This week we hurried and did all we could in Cotonou then hurried to Togo on Friday morning to be there for the arrival of President Ayekoue Friday afternoon, who was hurrying to be there for the arrival of Elder Craig Cardon from the Area Presidency on Sunday, who is hurrying to make a tour of the mission in three countries in one week. Hurrying isn’t comfortable in Africa, and we seem to be the only ones hurrying so maybe we need to get out of our hurrying mode. Actually we did have a little time on Friday evening and Saturday to visit with President Ayekoue and relax a little, but since this was our first solo trip to Lome we still had plenty to do and probably will each time we visit. Seems like when we are gone for a few days from Cotonou things really pile up and the same is true when we are gone from Lome for a few days. Actually, there is one time when Africans in general hurry. That is when they are going someplace. When an African gets behind the wheel of a car, life in general shifts into high gear. Soeur Black has absolutely forbidden me to make comments about African drivers and I often have to remind her to practice what she preaches. 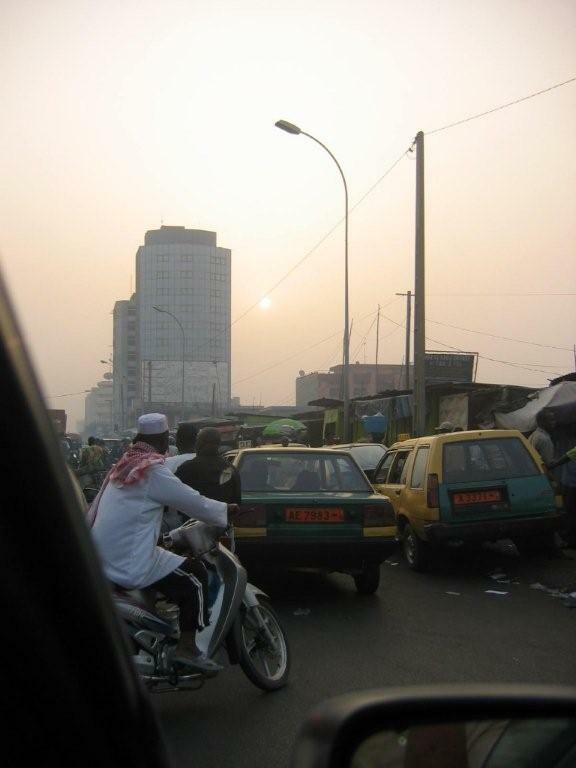 Going back and forth between Lome and Cotonou can be an experience. The preferred way to travel, since few have cars, is to catch a “taxi.” Taxi’s are generally black or brown Peugeot cars that haul people back and forth on the highway. The fare is divided by the number of passengers, so the more you can put in the car, the less expensive the taxi. As you can imagine, sometimes they are rather full. The quicker the taxi driver can get to the border and unload his passengers, the quicker he can pick up another load to come back so they are always in a hurry. Passing with the slimmest of margins from the oncoming car is okay. Even if the oncoming car has to leave the road at times, that is also okay. If someone is passing it does not necessarily preclude someone else from passing the vehicle that is passing. Another favorite is when the traffic is stopped on one side of the road, it’s okay to go down the other side into the oncoming traffic. That makes for some dandy traffic jams. Always, the basic driving rule applies – “if there is space, take it.” Nevertheless, we try to be careful and attempt to be “cautiously aggressive” so as to fit in with the flow and we have not had too many close calls and do not normally feel any more unsafe that you might traveling from Blanding to Monticello. You don’t have to leave town, however, to see some interesting things. Most of the roads in Cotonou are wide enough for at least two lanes of traffic or sometimes three, particularly if you get one wheel sort of up on the curb or the sidewalk. The lanes are not defined, and motos and cars alike go wherever they choose. Some of the streets are divided, and going wherever you choose does not exclude going the wrong way on a divided street or on a one way street. To make things worse, there is a general feeling that using lights at night increases gas consumption so a lot of motos and even some cars do not feel the necessity to spend the extra money for fuel. Traffic lights are a suggestion and are generally obeyed but not always. After the light turns red, there is always time for a few more vehicles and motos before the cross traffic starts. There also seems to be some unwritten rule that as soon as a traffic light changes everyone is required to honk. In fact, honking seems to be the only traffic rule that is generally obeyed by everyone (except me). I have never seen a rule book, but I am quite sure of what it must say. You are required to honk when a light changes, before passing another vehicle, after passing another vehicle, whenever you see a pedestrian trying to cross the road (without regards to how far ahead the pedestrian may be), whenever entering or leaving an intersection, and at any other time you note any possibility of any danger or feel threatened in any way. While this rule is strongly suggested for everyone from the “tinniest” sounding moto horn, for trucks it is absolutely mandatory – especially if your truck has a good loud air horn. We are not talking about a little “toot toot” warning honk but a 5 second minimum HOOOOOONNNNK. No one seems to have figured out yet that when one horn honks it means something but when everyone honks it is meaningless except to make noise. And so the honking goes on. We thought we had seen about everything but something new occurred this week. We were stopped in approximately the center lane for a traffic light not far from our house. The light stays red for quite a while. There was a car in the right lane behind some motos that kept honking and honking. The moto drivers looked back and finally moved out of the way in front of us so the right lane was free. The car then moved forward, ran the red light, made its way through both lanes of cross traffic while still honking, and made a left hand turn in front of everyone. I guess maybe the driver was in a hurry and he didn’t happen to have a siren. If you have a siren that is a lot better than a horn but I will have to talk about that later if Soeur Black will let me. Next week we will try to have more of substance to discuss.